Still without my laptop today (it’s hopefully getting fixed up in the shop), still working on Tom’s lended laptop, I thought I could catch up on blogging by sorting through the pics on my iPhone. Here are several pics I haven’t gotten around to posting for the past few weeks – until now! 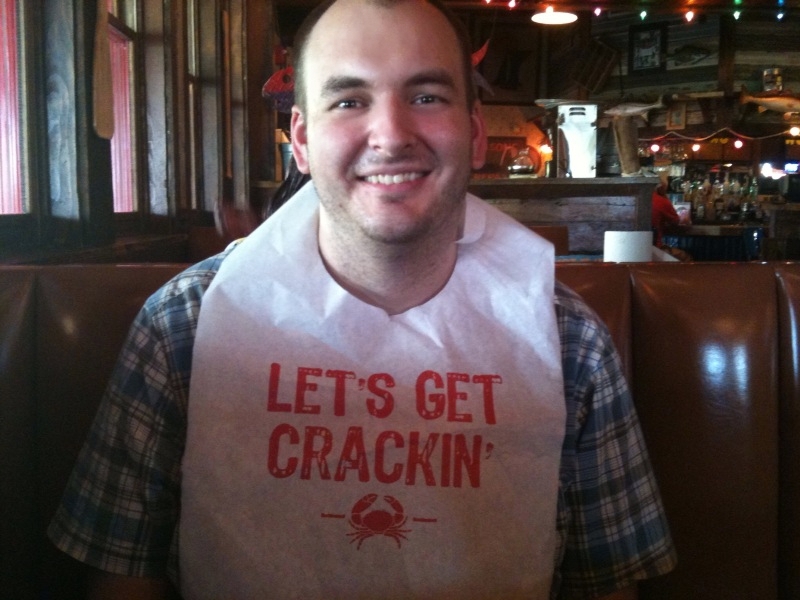 This was only our second time visiting Joe’s Crab Shack, despite how close we live, and I have to say I liked it a lot better the second time. 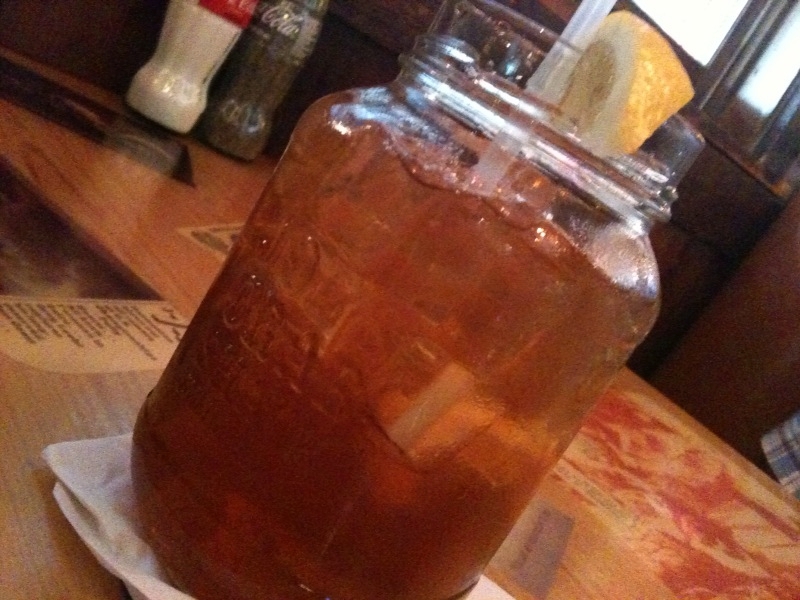 I tried one of their new mason jar drinks, Southern Spiked Tea – iced tea, lemon, and Seagram’s Sweet Tea vodka (who knew such a thing existed – I did not), and it was so delicious. I’m not one for a sickeningly sweet drink, be it pop, coffee, tea, or a cocktail, so this was perfect for me – just a tad sweet. Plus I got to keep the jar. Hollar. Tom didn’t come to play around. By no means. Serious business, people. 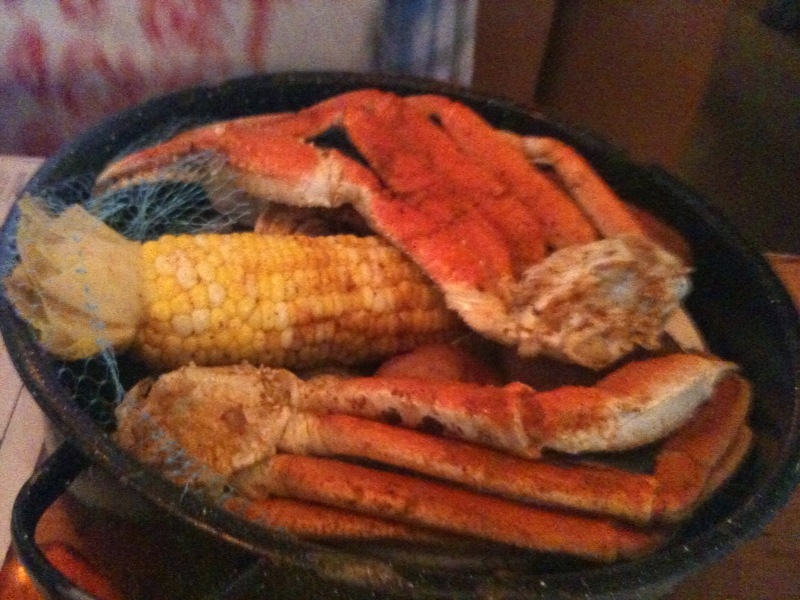 He ordered the Old Bay Steampot, chock full of snow crab, clams, sausage, corn on the cob, and ‘tatoes, all seasoned with Old Bay. His meal was more like an event. 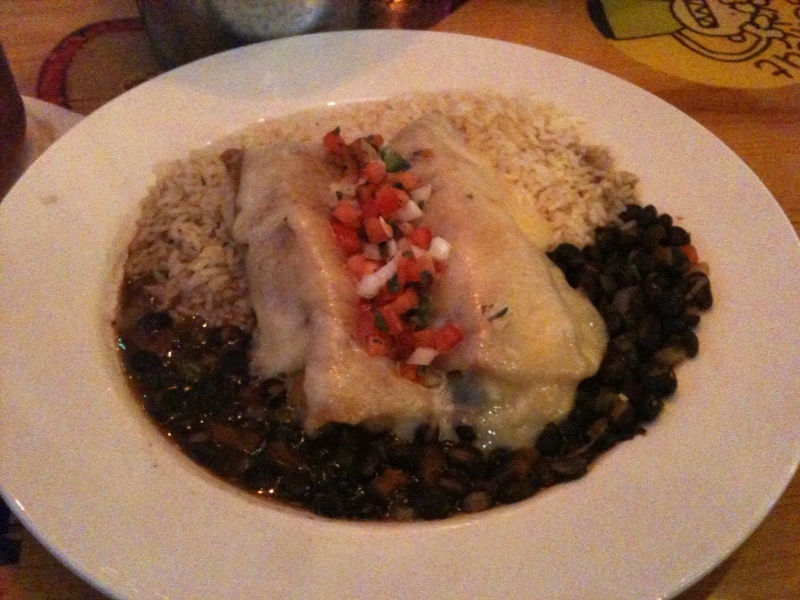 I, more modestly, ordered the Seafood Enchiladas, filled with crab and shrimp, and served with black beans and rice. Creamy and delicious. 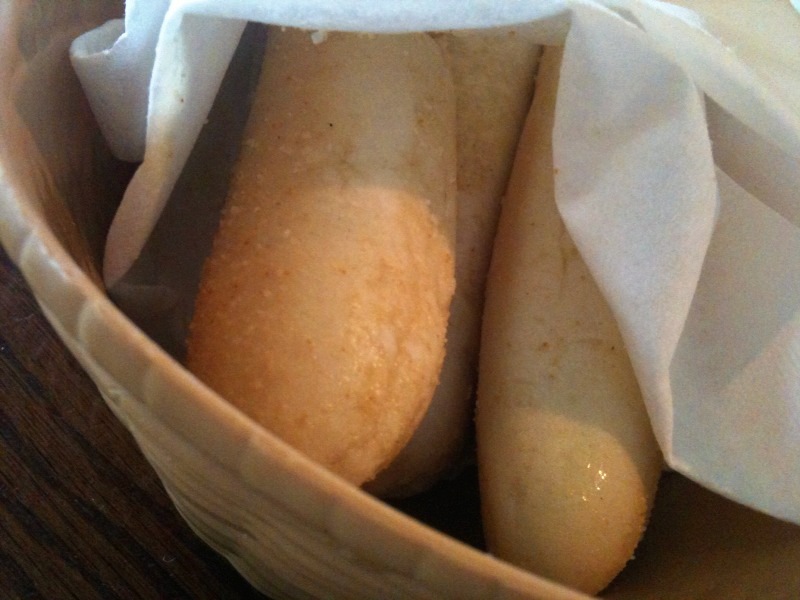 We also recently used a gift card given to us by my parents for our anniversary, for Olive Garden. 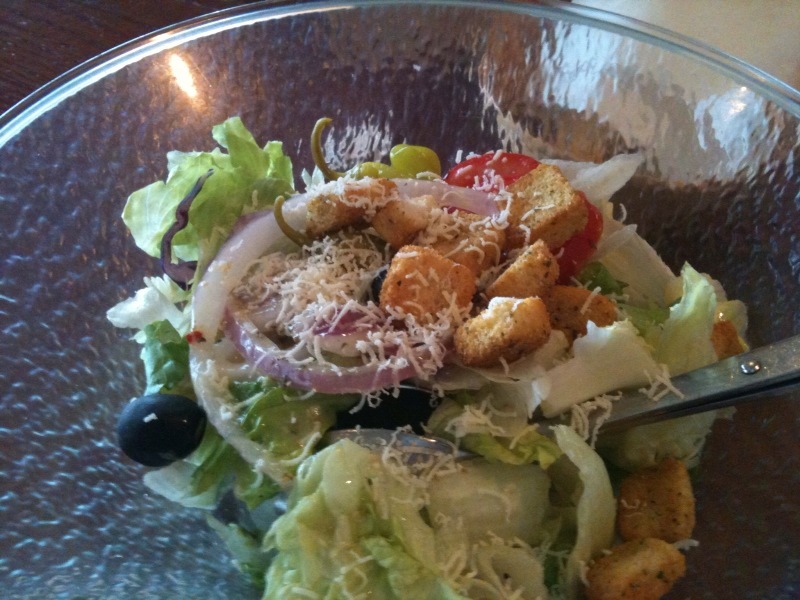 Gotta love that salad. That’s what I go for, anyway. 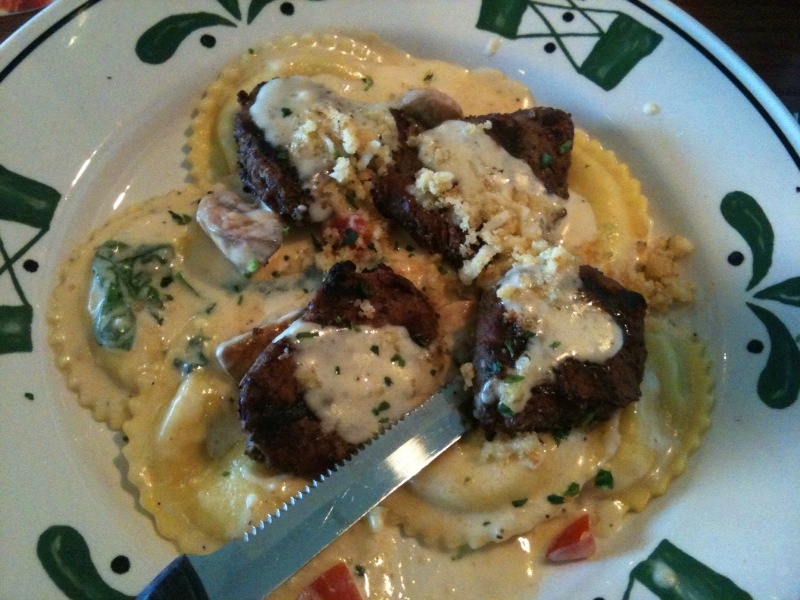 I went with the Parmesan-Polenta Crusted Steak with Ravioli. Their steak is surprisingly tasty! I really enjoyed this entrée. 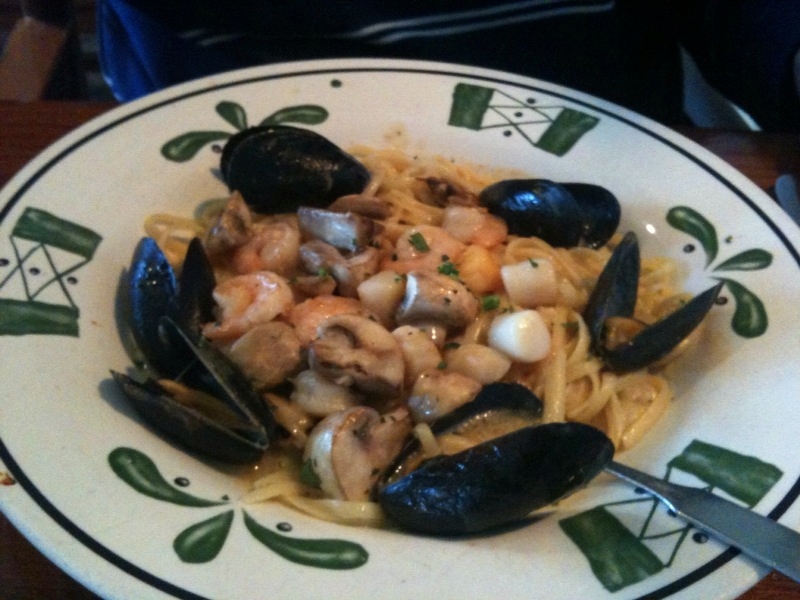 Tom ordered Seafood Portofino, "mussels, scallops, shrimp and mushrooms with linguine in a garlic-butter wine sauce." Mussels weird me out, but Tom loves them. Those ‘shrooms and scallops looked pretty enticing though. I’d say we had a solid meal. After eating at North Peak in Traverse City, we wanted to eat at Grizzly Peak right here in Ann Arbor. 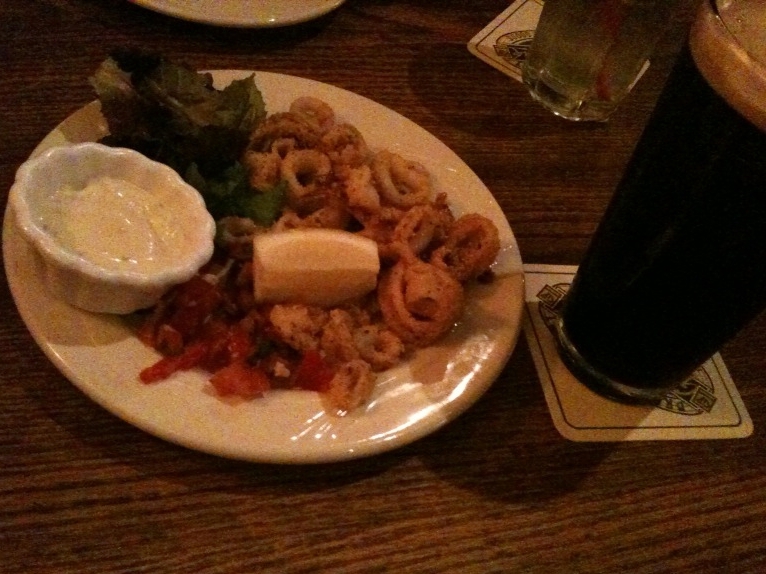 To start, we ordered the Corn-Dusted Calamari, "flash fried and served with rosemary-dijon aioli." Pretty much awesome. Indecisive little me (I know my indecisiveness drives Tom nuts 🙂 ) finally opted for the Roasted Pepper & Artichoke Hearth-Baked Pizza, and I was glad I did! 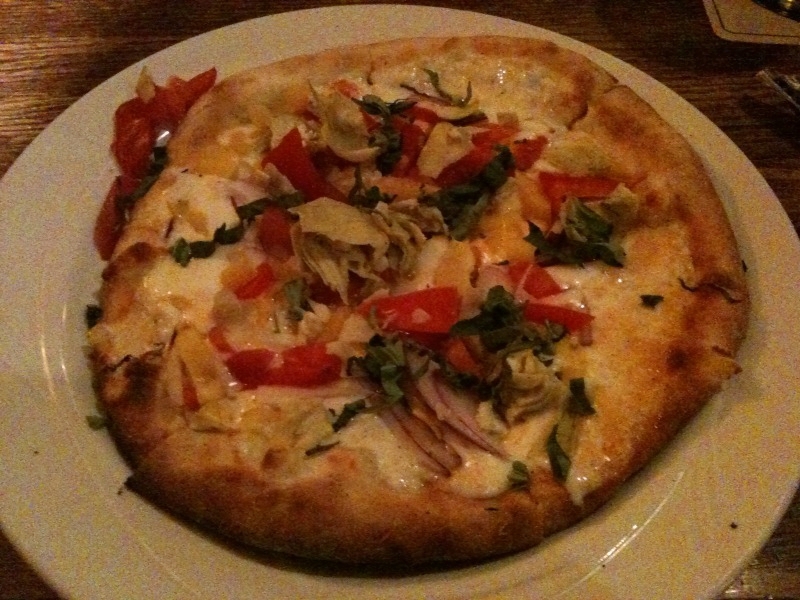 Warm, savory, and comforting melty cheese, but didn’t weight you down too much, since it was smothered in fresh veggies – artichokes, really good tomatoes, red onion, red peppers, and lots of fresh basil. I ate four of these pieces. Pub Fish and Chips were also calling my name, but Tom was the one who ended up ordering them. 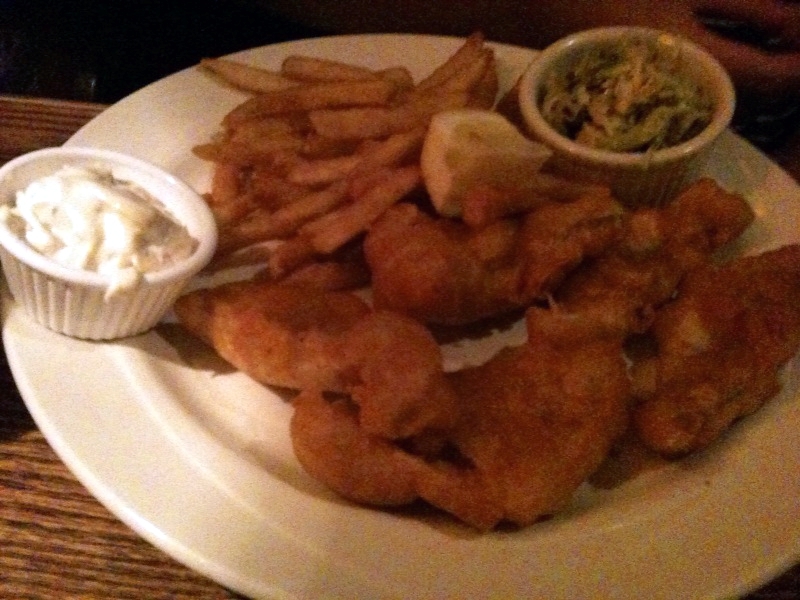 As their menu describes them, "beer-battered walleye, with artichoke tartar sauce, pub fries, and jalapeno slaw." Side note: Pet peeve of mine – people who don’t pronounce "jalapeno" correctly. Yes, I know I’m missing the swirly over the "n." It’s "holla-pain-yo," folks, not "holla-pee-no." Get it right. 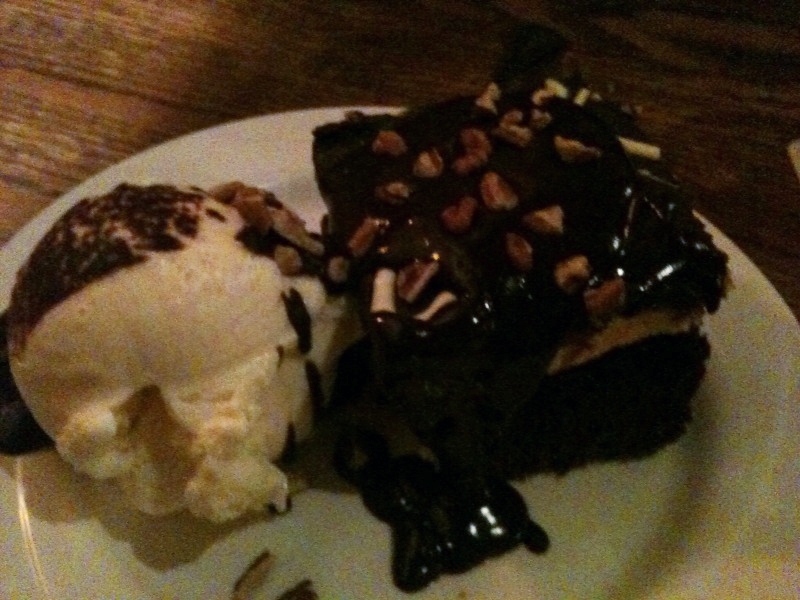 Figured we might as well go all out and order dessert while we’re at it, and we ordered the Black & Tan Brownie. I think got wide-eyed and may have uttered the words, "this is the best thing I’ve ever tasted," while eating it. Creamy cheesecake on a soft, chewy, warm brownie? Oh, and utterly doused in warm, rich chocolate sauce. Yes, please. ♪♫ Currently listening to: what would you say if I said I was listening to the same song as last night? Pingback: Grizzly Peak 7-Beer Sampler + Cheddar Ale Soup Swoon « Meg.Goes.Nom.Nom.